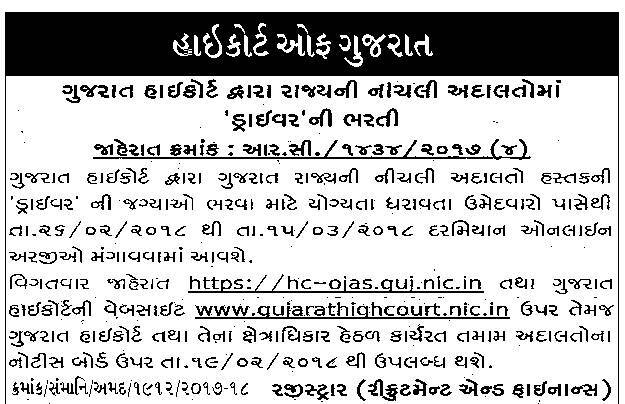 HC OJAS @ Gujarat High court Recruitment at hc-ojas.guj.nic.in: High Court of Gujarat has decided to recruit for Deputy Section Officer Posts. High Court of Gujarat recently published a recruitment notification for High Court of Gujarat Recruitment 2017, in which there have 46 seats. Any candidate who has met with eligibility criteria can apply for this recruitment on or before the last date no application will be accepted after the last date of submission. All information regarding the vacancy and its eligibility is mentioned below. It was formed in 1960 for the state of Gujarat and recently completed 56 years. Visit homepage of HC i.e. http://gujarathighcourt.nic.in/ to know about the establishment, location, jurisdiction, judges, new updates, services, current opening, career, latest job notification and plenty more details. We created this Gujarat High Court Notification 2016 – 2017 web page to publish new job information. The recruitment happens in Gujarat HC such as Translator, Stenographer, Computer Operator, Private Secretary, Legal Assistant, Assistant Junior Clerk, Judge and plenty more.